Do you remember this guy? 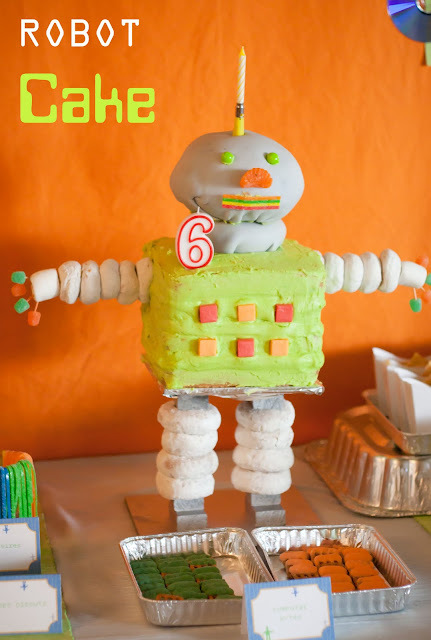 He was the centerpiece and focal point of my son’s robot birthday party last fall. I planned to explain the construction of the cake stand back then, but struggled to figure out the best way to do it. I had Boy Scout Barry help me film a video tutorial, but between my messy house, lack of video editing capacity, and BSB’s long-windedness (Shhh! Don’t tell him I said that! ), I never posted it. Well, I have a reader needing info THIS WEEK for her sons birthday party! So I’m going for it. Please ignore the aforementioned short-comings. I’ve thought a lot about doing more videos. I’ll be attending a vlogging workshop at evo conference next month, so I’d LOVE to know if you would like to see more videos on the blog in the future. We’d also LOVE to see if anyone attempts the robot cake stand/cake. Please let me know if you do! The video doesn’t show exactly how we put it all together. You can see where to put the donuts. I layered about 4 layers of square cake on top of the stand. We laid the dowel for the arms in between the top two layers, and strung on the arm donuts. I had planned to make hands by cutting a section out of two donuts to make a C-shaped hand. I can’t remember what went wrong. I think BSB might have eaten the extra donuts or something. 🙂 So he improvised with marshmallows and toothpicks. The head and neck are fondant covered bits of cake. I used the ball shaped pan, but kind of got that shape on accident. Another time, I might try and cover the entire cake in fondant, but didn’t have enough. I would also paint the metallic luster dust on parts of it like I did with the microphone cake. Starbursts make great buttons and you can really use any candies to make a face. The candle on the top of his head is one of the ones that plays “Happy Birthday to You.” It seemed like the robot ought to be able to make a little noise. So there it is! The robot insanity. I kind of think someone like Wilton should pay us a bunch of money for our good idea and then sell a kit with the stand, dowels and cake pans. Don’t you?